I scramble up and over the rusted-out hull of a small craft, lifting myself off what looks like a long mast dipping into water thick with oil slicks and who knows what else. Inside the boat, Cato walks one of the few planks left in the decayed deck. The opposite side of the plank shifts and lifts off the beam supporting it, and we all hold our breath. But Cato’s footing is firm and he crosses the deck and climbs down the opposite side. 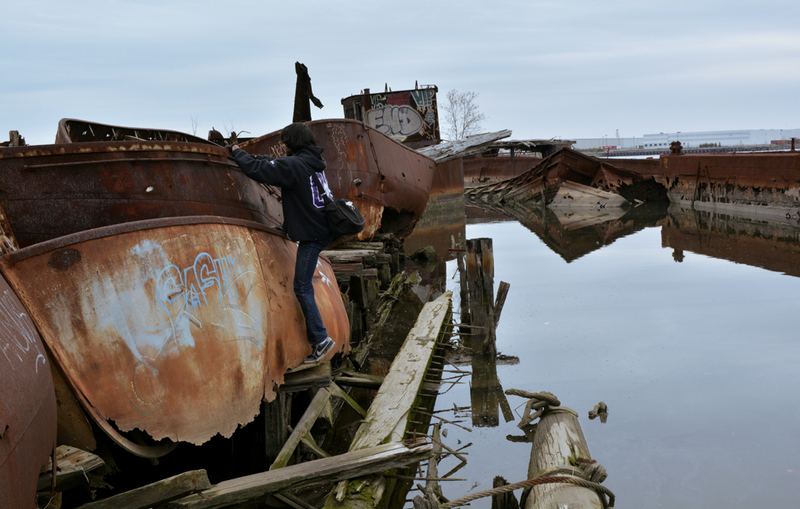 This hull sits in one below it like nesting bowls, a stack that makes up just a small fraction of the Staten Island Ship Graveyard. Nafiun leads the way up and over. This entry was posted in beer, cycling, pizza, travel and tagged exploration, Flagship Brewing, group ride, Joe & Pat's, New York City, ship graveyard, Staten Island on November 21, 2014 by Dylan Bargteil. Even before I left Cambridge, I was already investigating what sort of short bike tours I might be able to make out of NYC and beyond. And before I even found a bike to carry me, I’d already signed up for a ride. A few weeks ago, the New York City Homebrewers Guild made its second annual ride to Captain Lawrence Brewing in Elmsford, NY. Not only was it my first long ride since returning to the States, it was also my first group ride, which was a whole new biking experience. This entry was posted in beer, travel and tagged Captain Lawrence, cycling, homebrew club, narrative, NYCHG, Spinlister on October 8, 2014 by Dylan Bargteil. In their books, accomplished homebrewers often advise the reader to keep notes on how the character of a brew evolves over time. A brewer who has insight into how flavors and aromas lent by malt, hops, and yeast evolve over time can adjust the recipes and technique to make a beer ready for consumption sooner or improve its longevity by trying to achieve stable characteristics. With this in mind, I’ve waited over a month to review my session ale, but I’ve found that over that month the only thing that’s changed are my perceptions and opinions of the beer, while the characteristics of the beer itself have not. This entry was posted in beer, tasting and tagged BJCP, competition, lazy day ale, low gravity, NYCHG, session ale, summer on September 5, 2014 by Dylan Bargteil. I’ve been interested in adding fruit to my brewing, but with only one fermenter, I can’t commit to a long aging period. This has focused my attention into quicker fruiting methods, such as using pomegranate molasses. While at the Cambridge Beer Festival, I had a beer spiked with beet root, which got me thinking about vegetables in beer. Around the same time I spotted some vibrant stalks of rhubarb at the market and happened to come across this recipe for rhubarb syrup. I couldn’t ask for a more appealing confluence of inspirations – I had to seek out this tart vegetable to try brewing with it. This entry was posted in beer, brew day, recipes and tagged Brettanomyces, culture, dregs, Fantome, fruit, rhubarb, saison, Saison Dupont, starter, stuck fermentation, vegetable, wild yeast, yeast on August 21, 2014 by Dylan Bargteil. Six months have passed since I was last in the States. It was a long time without brewing. I came back feeling a bit apprehensive, somewhat doubtful that my brewing abilities didn’t atrophy. Nonetheless I was eager to turn around something quick, and so just a few hours after my return, I walked over to Bitter & Esters to pick up ingredients to brew a new version of my summer session ale, now named Lazy Day Ale. While I might enjoy this beer on such a day in just a few weeks, brew day was anything but lazy, exercising my new knowledge of brewing water as well as trying out some new beer body building techniques. This entry was posted in beer, brew day, equipment, learning, recipes and tagged brewing salts, competition, lazy day ale, low gravity, orange peel, pH, session ale, water on August 7, 2014 by Dylan Bargteil. I rose early Sunday morning, put on a pair of purple nitrile gloves, and flipped my bike over to adjust my rear derailleur. The previous evening, I’d struggled up the steep hill to the hostel without being able to reach my lowest gear. I knew I had a long day ahead with many steep climbs, and was eager to get going with an ample 12 hours to reach Sheffield before my train departed. I didn’t yet realize just how much of a challenge the 65 miles and around 1600 meters of ascent would present. This entry was posted in travel and tagged Blue John, Castleton, cycling, folklore, history, Mam Tor, narrative, Peak District, Robin Hood on July 21, 2014 by Dylan Bargteil.